Constans, his laureate draped and cuirassed bust right. The image below was photographed by Paul Bulgerin. The image above is my own scan. 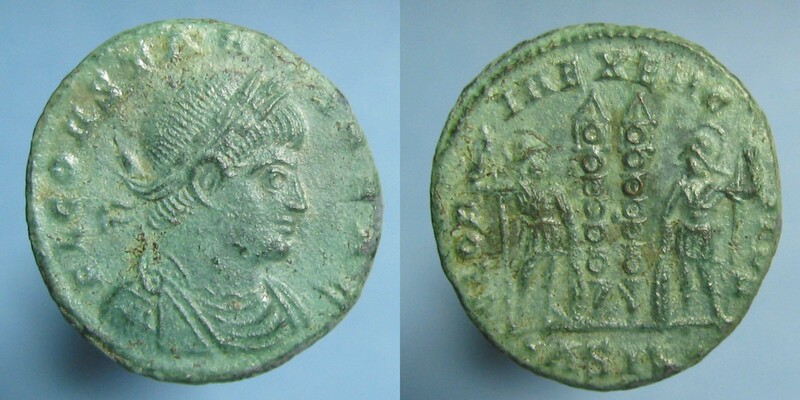 Minted at the 1st offiina A (or 4th - Δ) in Siscia (Sisak, Croatia) in 334 or 335 A.D.
Kent, J.P.C., "Roman Imperial Coinage", Volume 7 (RIC), Siscia, p456, nr. 238. Carson, R.A.G., Hill, P.V., & Kent, J.P.C., "Late Roman Bronze Coinage" (LRBC), Part I, p19, nr 752.
hinterlassenen Sammlung und Aufzeichnung des Herrn Paul Gerin" (Voetter-Gerin), Siscia, Constans, p302, nr 1. 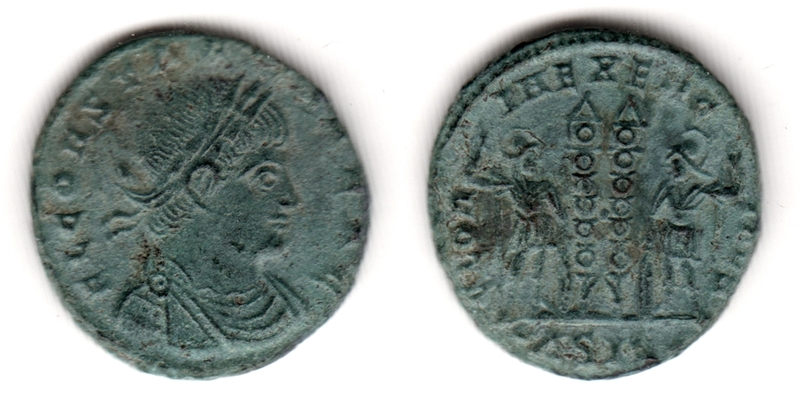 Failmezger, V., "Roman Bronze Coins From Paganism To Christianity 294-364 A.D." (Failmezger), nr 365CN. Cohen, H, "Descriptions Historique des Monnaies frappees sous l'Empire Romain" (C), Volume 7, p414, nr 73. Van Meter, D., "Handbook of Roman Imperial Coins", p297, nr 47, variety with ol/3.